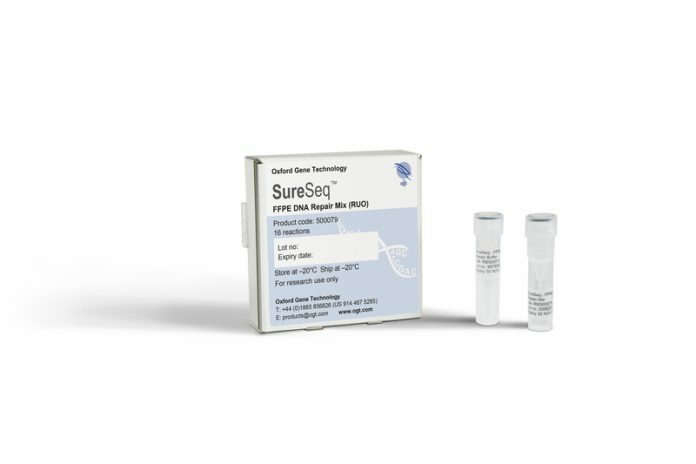 The SureSeq™ FFPE DNA Repair Mix is optimized to restore a broad range of damage in formalin-fixed, paraffin-embedded (FFPE) derived DNA. The mix effectively repairs DNA damage, improving library yields, on-target rates, and mean target coverage, while removing fixation and storage artifacts and reducing the amount of starting material required. The SureSeq FFPE DNA Repair Mix increases success and accuracy of hybridization-based NGS for FFPE samples by repairing damage such as nicks and gaps, oxidized bases, blocked 3’ ends and deamination of cytosine to uracil. Repairing the damage in this way enables a reduction of the amount of required starting material down to as little as 100 ng while delivering quality sequencing data for the utmost confidence in variant calling.